Hi there! Welcome to Your Vibrant Family! 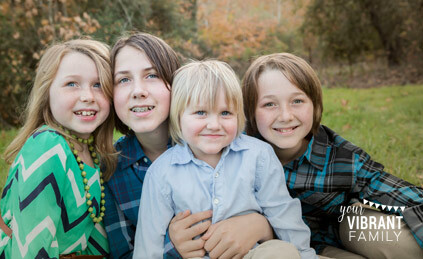 I’m Alicia Michelle, and I’m a married, homeschool mom of four kids ranging in age from fifteen to five. I am thrilled that you’re here and I can’t wait to encourage you and to share stories together. If you and I were to sit down face-to-face today at a coffee shop (here’s what I’d be drinking … what’s your favorite hot drink? ), I hope you’d see me for who I am–a transformed-but-beautiful-mess of a woman. Any good that is in me comes from the power of God shining through my heart. You can read my testimony (my most important story) here. When I first became a mom fourteen years ago, I had no idea how much parenting would change me. 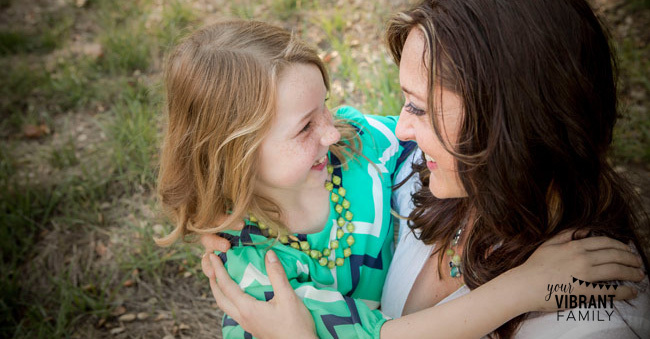 Being a mom has taken my breath away many, many times–because of both the exhausting relentless nature of motherhood, and the indescribably amazing moments of joy. Before I became a parent, I never thought I would have kids who didn’t always get along (“those parents” just weren’t doing something right); kids with ongoing learning/social challenges (why couldn’t “those parents” just teach their kids differently and it would all be better? ); and even kids who, although they were raised from birth to know God, sometimes made extremely poor choices. Ladies, can we talk about the noise? Holy cow. Although I love hanging out and playing with my munchkins, no one ever told me how much I would utterly crave silence as a mom! And homeschooling! Wasn’t that supposed to give us perfectly schooled (and behaved) kids? My husband and I had done our research and were convinced that homeschooling was the best solution for every family. Nearly 10 years later, we are more convinced than ever that homeschooling is a beautiful calling for many, but not all; and that,within the homeschooling lifestyle, there simply is no “right” or “wrong” way to teach a child and that’s not only alright, but it’s evidence that you’re listening to your unique call for your family and your children (and that’s a great thing). In terms of marriage, I have been surprised many times by the power of love. Our nearly-fifteen-years of marriage has not been perfect, but at the core, we love God (and each other!) deeply. We can testify to what the good book says:”love covers up a multitude of sins” (1 Peter 4:8). And honestly, I’m often the obnoxious one (an unfortunate side effect of my passionate, over-zealous heart) that needs to ask forgiveness. Through life’s ups and downs, my husband and I have fought to have a strong base for our family by continually working on our marriage and on our relationship with God. It’s never easy and we often fail, but through it all, He has proven strong enough to help us weather any storm (including our current battle with ongoing an ongoing illness). Those battles (along with our son’s Aspergers diagnosis) have taken us on a journey through the world of natural living (things like essential oils), healthy recipes (my husband, my son and I maintain a fairly consistent gluten-free, low-carb lifestyle) and ways to lower stress in the midst of a hectic schedule (I’m convinced it starts with saying no so you can say yes). Be sure to follow me on Pinterest, Twitter, Instagram and Facebook so that we can stay in touch! Or email me anytime at alicia@yourvibrantfamily.com if you need prayer or just want to chat. P.S. You can read other crazy things about me here, such how I used to drive a very famous giant hot dog and how I served as a midwife in an African medical clinic. Come on, you know you’re curious. P.S. Are you a brand looking to connect? Learn more here. Ladies, motherhood, homeschooling, marriage (and even maintaining a healthy lifestyle!) is very challenging…. but with God at the center of all of them, these things can be oh-so-good too. And at the end of the day, that’s the greatest message I hope to convey through every aspect of this site–in the blog posts; in my books and online courses; and in the Facebook community. Bottom line: friend, I want Your Vibrant Family to encourage and inspire you to be the best (imperfect) version of yourself you can be. Our homes (or our families) don’t have to look like a Pinterest-perfect image in order to be good. If that were true, lasting joy would never be possible! If you get stuck in that place (like I do too sometimes), I want this site to remind us that beautiful miracles are all around us as we walk through the chaos of everyday family life. I also want us to both to remember that we’re not alone through the (sometimes very long) mothering days, and that we are best when we lean on each other and share good ideas. Speaking of good ideas, Your Vibrant Family is full of great tips for managing a household, being the best mom possible, keeping a strong marriage, and growing in the Christian faith. 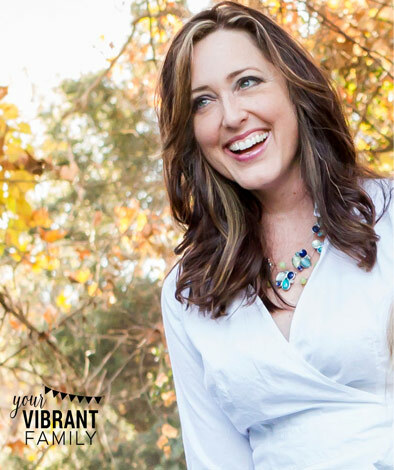 You’ll find a new post from me about two to three times a week, and a plethora of fresh content daily on the Your Vibrant Family Facebook page. You can read some of Your Vibrant Family’s most popular posts here. I’ll be sharing my stories and all the things God is teaching me (even those that come from my biggest messes). I’ll also be praying daily that you will find real hope for your journey too! This course is changing lives around the world! If you’re looking to (finally) take control of your mommy anger, this 7-class course is an excellent resource. Consisting of 7 video classes and 50+ pages of homework (think journaling prompts, charts, etc) and a Facebook group for accountability and encouragement, “7 Days to a Less Angry Mom” is a powerful way to identify key anger triggers and make a plan for peace and calm (yes, even in the midst of raising kids)! This is a self-paced course that is open for enrollment anytime. We’d love to have you in the course with us! You will love the new freedom and peace possible when mommy anger doesn’t control your life anymore! Learn more here. 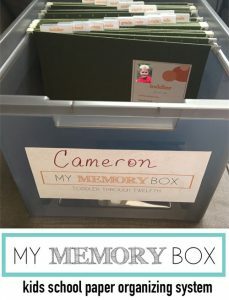 If you have stacks of your kids’ school paperwork (think adorable drawings, school awards, etc) and have no idea what to do with them, My Memory Box is the perfect solution! 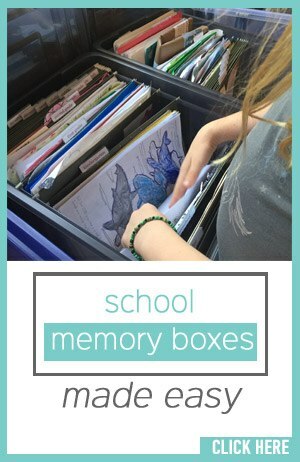 My Memory Box gives you the system to keep your kids’ precious artwork and school work (from toddler to 12th grade!) organized (no more crazy piles!) and preserved for years to come (in one central place). This 26-page printable PDF contains four colors of this organizing system so that you can design a beautifully simple-yet-practical Memory Box for each of your kids! Go here to learn about My Memory Box and discover why hundreds and hundreds of families worldwide use this system (and love it!). Want more Christ (and less chaos) in your family’s Christmas celebrations? I did too. I wanted my kids to really understand the true meaning of Christmas (that it’s more than presents and lots of good food). I wanted practical ways for our family to live out our Christian faith with fun, Christ-honoring activities. The funny thing is that I realized that I wasn’t alone! SO many of you want this same type of Christmas that truly centered around Christ. That’s why I created these amazing Christ-Centered Christmas resources for families! These tools give you everything you need–including a 30-day Countdown to Christmas Bible study, Christmas-themed Acts of Kindness activities, kids’ crafts and other family activities, plus beautiful home decor printables–to create the wonderful, Christ-honoring family Christmas celebrations you’re looking for. Take back your family’s Christmas with these incredible resources! Plan to Be Flexible was the first book I wrote, and it is my honest confession of a mom (me) who felt chewed-up-and-spit-out by the homeschool lifestyle. While chronicling my own first few years, the book offers practical advice and loads of tips on how to (really) follow a child’s unique learning patterns (hint: it’s not about a schedule!). 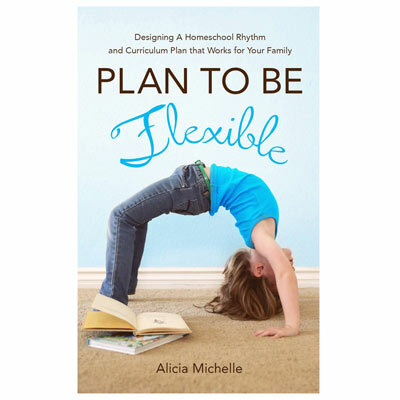 Plan to Be Flexible is available in print and Kindle on Amazon; or here on the Your Vibrant Family site as an individual PDF download or as a bundle with a other homeschool resources. You can see what other bloggers have said about Plan to Be Flexible here and also read the 5-star testimonies from others on Amazon. Download a free chapter of the book here. This is my most recent book! I love this book because it’s a much-needed compilation of how to successfully start a homeschool year. Back to School Survival Manual is not only my step-by-step approach of how to prepare mentally and physically for back to school, but it offers 30 pages of reproducible 8.5 x 11 inch checklists, charts and planning activities! This is an invaluable reference tool you can use every year. 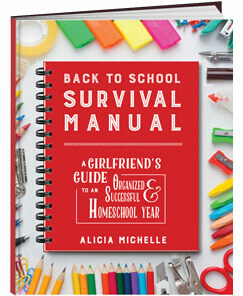 Back to School Survival Manual is available in print and Kindle on Amazon (5 Stars! ); or here on the Your Vibrant Family site as an individual PDF download or as a bundle with other homeschool resources. Read what others have to say about it here, download a free sample chapter and order your copy! We’d love for you to join the conversation on one of Your Vibrant Family’s social media channels! Follow us on YouTube, Pinterest, Facebook, Twitter or Instagram. Thank you again for being part of the Your Vibrant Family community. I’m so glad you’re with us!